These days, conference seem to be the only opportunity for me to travel out of Brisbane. The EMCORE conference this year was held in Melbourne and together with MXM, we attended this full on conference focusing on emergency topics. Phew! Luckily we managed to dose ourselves with caffeine prior to the start of day. Mr Benjamin Cooper, the head chef of Chin Chin had just made an appearance in MasterChef Aus that week. Imagine my excitement when I saw a glimpse of him in the kitchen! 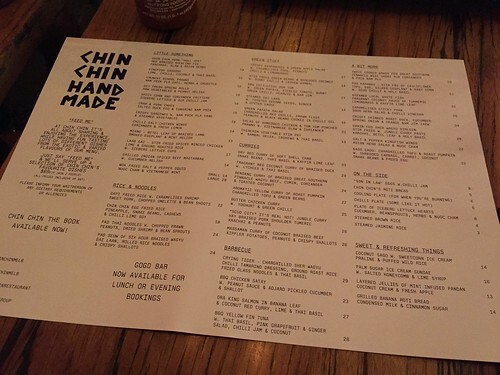 Chin Chin's menu is simple and straight forward. For an option of 'Feed Me' and at $69 per person, a selection of favourites will be served. However, we decided to choose our own selection that night. For entree, I had my eye on the 'crab and pork cakes'. 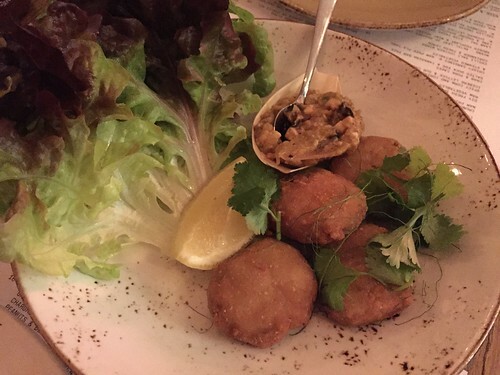 They were served with salted duck egg and tamarind nam prik. The salted duck egg flavour was quite mild, not what I expected. The combination of salted egg and tamarind nam prik is so new and interesting for me: a bit salty, spicy and sour. 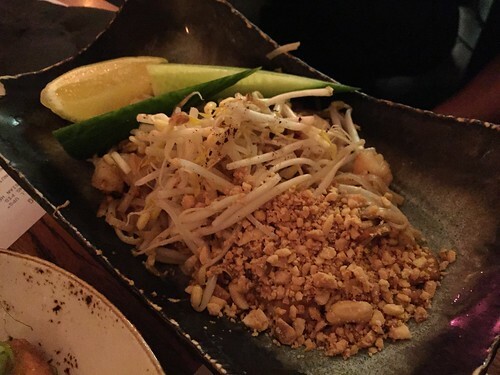 A dish like pad thai, is a must order for me in a Thai-influenced restaurant. I certainly could not resist ordering one in Chin Chin! Oh my! Both MXM and myself were so elated eating the flat rice noodles served with fresh prawns, bean sprouts, dried shrimps and chopped peanuts. The flavour of the noodles was well balanced and I certainly enjoyed the crunch of the bean sprout. Well done! Can you see a trend now? We tried to order a meal from each section. For the GREEN STUFF, we had the green papaya salad. Caution ahead: It was spicy, too spicy for me! 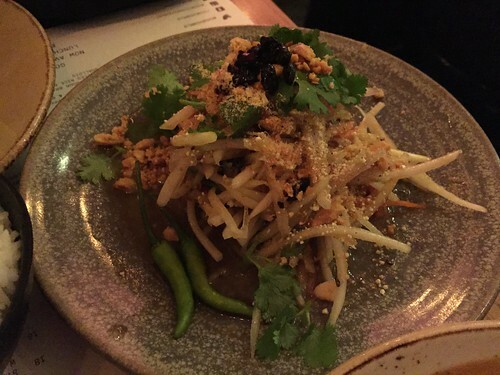 I do enjoy the freshness of the green papaya but there is actually bits of chilli seeds mixed into the dressing.... I had to give up after a few mouthfuls but MXM continued to push through, claiming it was torturous but yet it was exhilarating. LOL! 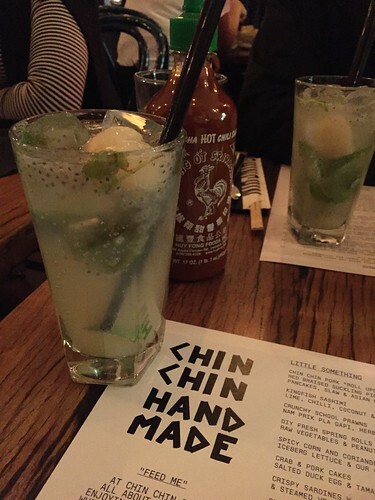 Our non-alcoholic drink: thai basil seeds, with lychee and mint managed to soothe some of the spiciness. Among the CURRIES section, the duck curry tempted me the most and I know the combination of duck and lychee is yummy. Hehe! 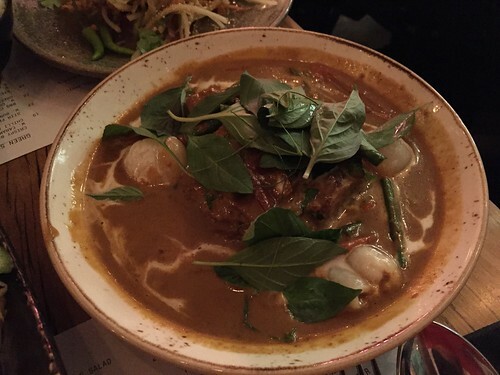 The red coconut duck curry certainly did not disappoint and we both agreed that was our favourite meal of the night. The meat was so tender, falling off from the bone easily and the curry itself was intense, well-balanced and flavourful. I could not ask for more! We were full at the end of the meals but I think MXM can read my face that I would like to have some dessert. 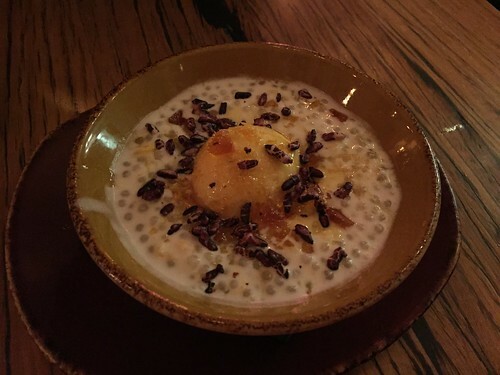 Among the four options available, we both chose the coconut sago with sweetcorn ice cream, praline and puffed wild rice. Yum! It was moreish! Chin Chin is definitely a place worth visiting and waiting for. It is not a quiet dining place and having a loud voice will be an advantage as well as an empty stomach on visit. Although this place is busy, the staff members are polite and helpful and the meals arrived in a timely manner. Hope to return one day!